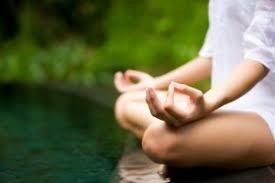 Meditate for health and harmony…. The Inn at Laurita Winery has a tranquil meditation room attached to the Inn where early risers can enjoy the peace and quiet while meditating. Pillows, yoga blankets and candles are provided. In this soothing room we also offer individual and couples massages in our 2 treatment rooms. Come and balance your mind, body and spirit. We found the following article interesting enough to share as it relates to the above. In today’s world people are getting back to realizing the benefits of meditation. Compare your daily routines to just 20 years ago and I think most us would agree we are over scheduled, stressed and in our opinion, way too reliant on technology. Just ask “Alexa”! We hope you find this an interesting read! A team of researchers from China and the University of Oregon have developed an approach for neuroscientists to study how meditation might provide improvements in a person’s attention and response to stress. The study, done in China, randomly assigned college undergraduate students to 40-person experimental or control groups. The experimental group received five days of meditation training using a technique called the integrative body-mind training (IBMT). The control group got five days of relaxation training. Before and after training, both groups took tests involving attention and reaction to mental stress. The experimental group showed greater improvement than the control group in the attention test designed to measure the subjects’ abilities to resolve conflict among stimuli. Stress was induced by mental arithmetic. Both groups initially showed elevated release of the stress hormone cortisol following the math task, but after training the experimental group showed less cortisol release, indicating a greater improvement in their stress regulation. The experimental group also showed lower levels of anxiety, depression, anger and fatigue than was the case in the control group. The IBMT approach was developed in the 1990s. Its effects have been studied in China since 1995. The technique avoids struggles to control thought, relying instead on a state of restful alertness, allowing for a high degree of body-mind awareness. while soothing music plays in the background. Thought control is achieved gradually through posture, relaxation, body-mind harmony and balanced breathing. IBMT has been found to improve emotional and cognitive performance, as well as social behavior in people said lead author Yi-Yuan Tang, a professor in the Institute of Neuroinformatics and Laboratory for Body and Mind at Dalian University of Technology in Dalian, China. From all of us at the Inn at Laurita Winery, may health and harmony to be yours!